Yea that’s right. Me. Your very own and only Brady Speers. HeHe. First of all, it feels like it was just last week I was in my 20s and going to Howard Payne University as a student along with the likes of Curlee, Locks, Cofresi, Rinehart, Cozart, Hines, Wakefield, Carter, Davidson, just to name a FEW out of the many I hung with. Now I am 45 (in a few months) with three kids, a wife, and two dogs. So, to have an opportunity to pay forward all God did for me while at HPU by serving the school for a little while gives me great joy. I loved and still love the school. Those were some of the greatest years of my life. For real. Hopefully, I can stir up some trouble down in good ol’ Brownwood on behalf of The Fellas. Either way, it should be fun and I get to eat at Underwoods every now and then. What else could a boy like me want??? I love, love, love South Korea. The people, the city of Seoul, the history, the architecture, SOME of the food, the traditions, the sights and sounds, and most importantly the Eastern Welfare Society which took care of our son and his birthmom nearly 7 years ago. This time 7 years ago Julie and I were on a plane headed home with Quinny in our hands having just traveled around the world to experience his homeland and meet him for the first time. He needed a family and we needed a son. Words cannot express how proud we are of him and all he represents to us. God was beyond good. Adoption rocks and so does South Korea. Thanks to all of you who supported and helped us along the way. You too were a part of bringing Mr. Smiley into our world and we celebrate that on this his Forever Family Day! I am a huge believer in creating a childhood of memories for my kids. Nothing in life will last more than the things you DO with them. And few things can rival jumping in a car or getting on a plane and heading somewhere neat and fun. Sadly, more and more parents put work and busyness on the top of their list. Suddenly, the years fly by and you’ve basically gone nowhere with the family other than a trip to the grandparents. That’s better than nothing, but there is a world out there to see and your kids should experience it…with you! I know it’s tough and I get money can be tight, but nothing is a better investment than finding a way, any way, to get away as a family and see and do new things together. It will last a lifetime. Maybe a trip to Enchanted Rock, or a weekend at the lake, or a few days on the beach. It’s our job as parents to be creative and fun. Making money and just paying the bills is certainly top priority, but most of us in America can find a way, if we truly want to, to get a way with the littles. Draw a circle of out from your home of places you can go within a 1 days drive, say 10 hours or so. You will be surprised at what’s close enough to go see. Look for special hotel or online offers to save on hotels or attractions. Consider going on quick, long weekend trips if you can’t afford to be gone long or the costs are too much. A lot can be done in just a few days! Find friends in those areas and bunk up and enjoy time all together. Save money and put it on the calendar a year in advance. This will build the excitement in the family and ensure that the trip gets done! Ask for suggestions with others you know. You’d be amazed at all the connections and ideas you likely have! Take the kids out of school a few days and go when places are slow. We love this. Kids can miss a few days and it maximizes your time and dollars spent…plus it makes the kids feel even more special to get out when everyone else is going to class. Toys, games, and stuff never last. Time with each other, on the road headed somewhere will last forever. It can be frustrating and at times tempers may flare, but one thing is certain. They will jump up and down the next time you say you’re headed somewhere. Two big things have been accomplished in our kids lives the last year. One, and most important, they got saved last fall and are now all Christians. Two, and just behind that, they love Colorado and love to ski! We headed to the mountains for a visit with our friends Clint and Alisa Locks last weekend for our first ever winter-time visit to the Rockies. It had been 7 years since we last skied and I missed it. Julie tore her knees real bad and was somewhat timid about the whole thing. I have always loved being in God’s country and seeing His creation. It’s always been one of my favorite things to do. We had no idea if the kids would truly dig the cold and snow and love skiing. After all, learning to ski can be a total pain in the rear. Julie and I both learned to ski later in life as teenagers. I have always hoped that my kids would learn and love it as kids. Seeing these other littles fly down the mountain without poles in reckless abandon has always been a hope for me. Years later, I am now the dad with three of them! Holy cow. After one day of lessons by the amazing people at Copper Mountain all three of them were hooked like a Boulder hippie loves the legal weed! We spent Sunday skiing with the Locks and their two littles, Bree and Addi, and now they can’t wait to go back! I guess the only problem now is I just better prepare to make that 14 hour drive once a year! It’s been fun to watch, and yes they do complain about it at times, but the kids are learning the Korean martial art. 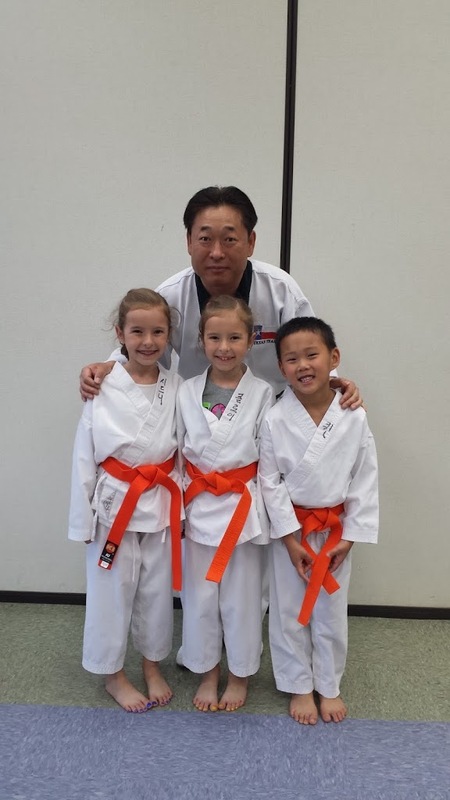 This last week they earned their Orange belt to go along with their White and Yellow belts. Kids these days need activities that are wholesome and full of values. Their Master Mr. Yang is so great. He teaches them about family values while teaching them how to protect themselves if ever need be. It’s like he’s a modern day Mr. Miyagi.